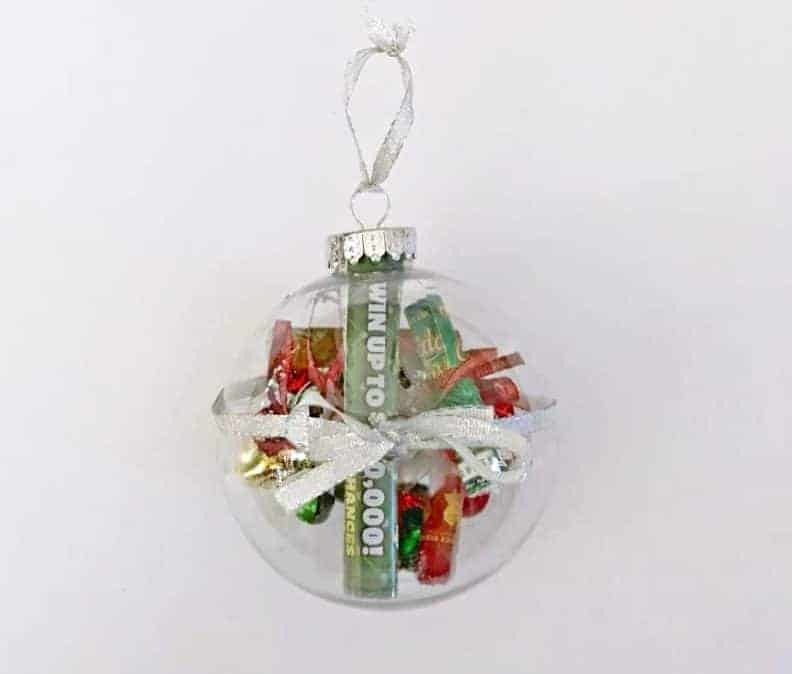 Thank you to NJ Lottery for sponsoring this fun and easy Christmas Lottery Ticket Ornament DIY gift idea post! I received NJ Lottery Holiday Instant Game Tickets and compensation to facilitate this post. On their own, these Holiday games make great stocking stuffers and holiday card stuffers for anyone on your list (over the age of 18, of course!). 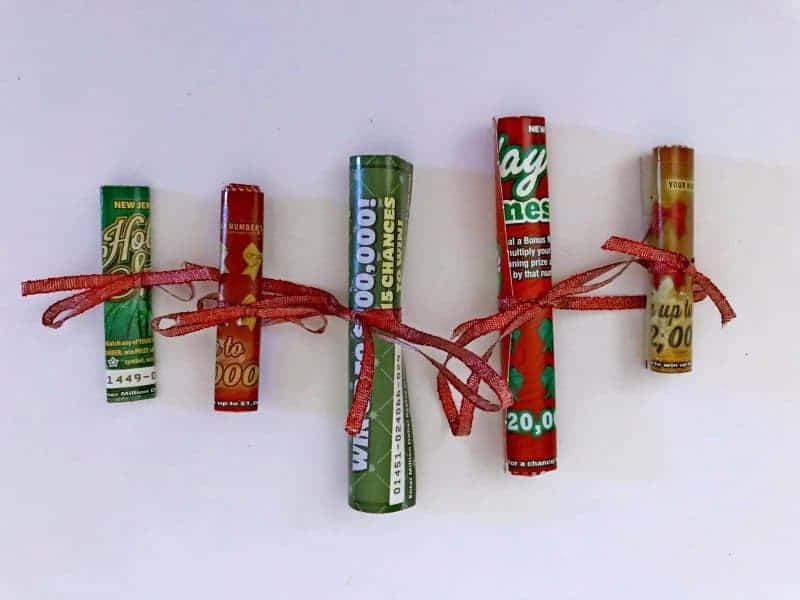 But, if you are looking for a more fun and unique lottery ticket gift idea, I have a fun and easy DIY lottery ticket ornament craft to share with you today. This Christmas lottery ticket ornament takes minutes to make and is perfect for gifting. 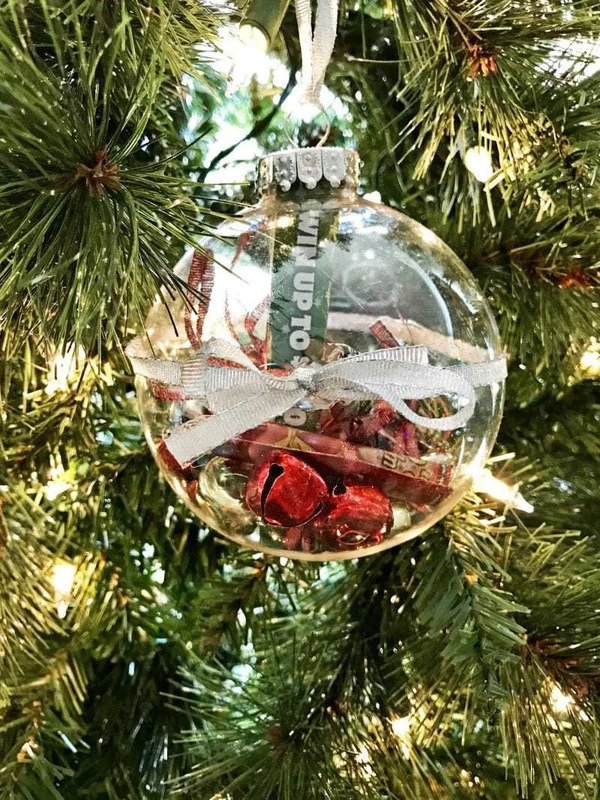 I chose to fill my ornament with $10 in NJ Lottery Holiday Instant Games tickets, but you can really choose any denomination and number of tickets to include. This way, you can make the gift an inexpensive or generous as you would like. These Christmas lottery ticket ornaments would make a great gift for neighbors, teachers, relatives, and really anyone and everyone on your list who is over the age of 18. 1) Tie a ribbon around the clear ornament, and secure with glue. 2) Roll each lottery ticket and tie with ribbon to secure. 3) Open the clear ornament and place jingle bells and lottery tickets inside. 4) Close up the top of the ornament and add a ribbon loop for hanging. That's it! Your Lottery ticket ornament is now ready for gifting. See, I told you it was easy! If you are looking for more fun DIY lottery ticket gift ideas, check out the video below featuring a fun DIY Lottery ticket wreath craft as well as these 5 awesome Lottery ticket gift ideas. 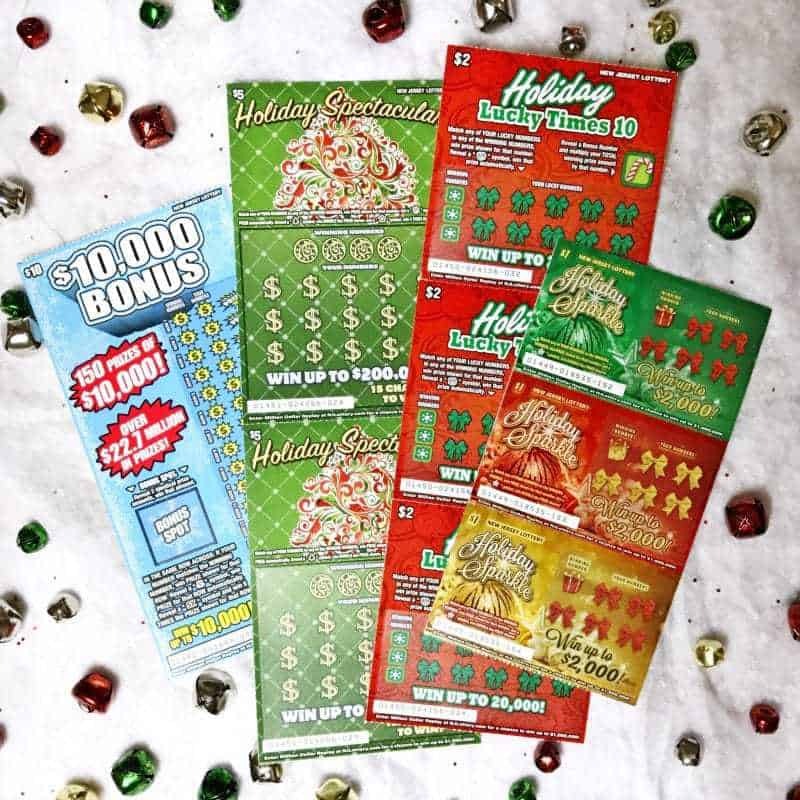 You can pick up NJ Lottery Holiday Instant Games at your local Lottery retailer, such as Quick Chek, 7-Eleven, Krauszer's, or Wawa. While you are at it, go ahead and pick yourself up a few tickets as well. You never know – you could be the next big winner! What would you do if you won big? Don’t forget to enter your non-winning NJ Lottery Holiday Instant Game Tickets into the Million Dollar Replay for a chance to become a MILLIONAIRE! Simply join the NJ Lottery VIP Club and enter $10 of eligible NJ Lottery non-winning instant game tickets for your chance to win. 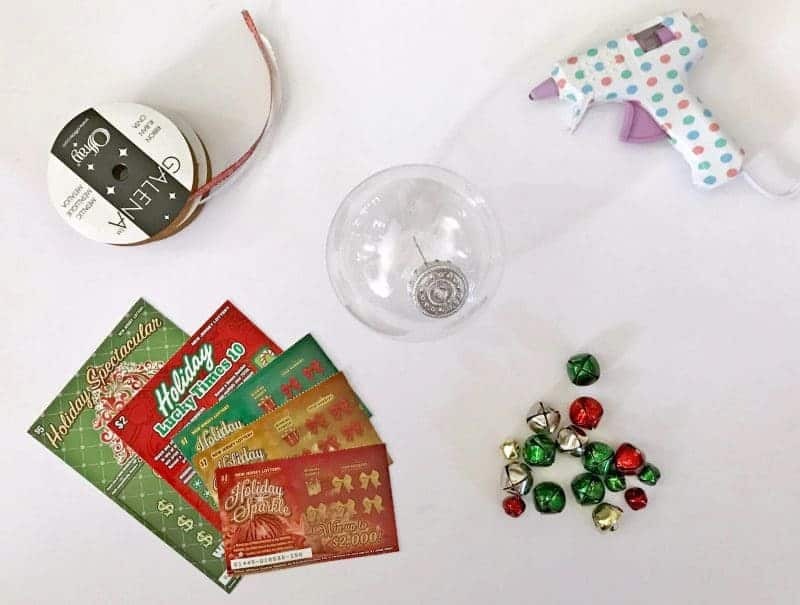 I hope that you enjoyed this easy Christmas Lottery Ticket Ornament DIY gift idea, and that you have a very happy holiday! For more information on NJ Lottery Holiday Instant Games, visit New Jersey Lottery. You must be 18 or older to buy a lottery ticket. 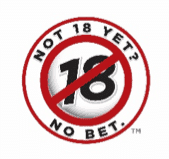 The New Jersey Lottery reminds players, it's only a game…remember to play responsibly. If you or someone you know has a gambling problem, call 1800-GAMBLER®. This is such a cute gift idea. I need to give this a try. I enjoy doing scratch off tickets. Wow I really love this! How unique and creative! What a great idea!! We are doing an ornament exchange for hubby’s family Christmas and Im totally doing this!! I like these ideas on how to give them. I would give these to coworkers but the ornament idea is a cute way to give them! I love this idea!!! I filled on with my second daughter’s birth hat and hospital bracelet.